Perhaps because a posting on the ‘roof of the world’ seems to bring Communist officials good luck in their career. Tibet’s regional Government. He has just been appointed as the head of the Communist Youth League, “A training ground for future party and Government officials with nearly 80 million members” as the South China Morning Post put it. Guangdong party secretary Hu Chunhua, often considered the future leader of China in 2022, had earlier followed the same trajectory: first Vice-Chairman of Tibet’s regional Government in 2003 and then Youth League boss in 2006. Hu (not a relative of former President Hu Jintao) is now a member of the all-powerful Politburo of the Chinese Communist Party (CCP). Qin had taken his job in Lhasa in 2005 as Lhasa Party Chief; he later became Vice Chairman of the Tibetan Government. Qin has an illustrious predecessor. In September 1987, Lhasa witnessed a series of large-scale riots. As the Chinese leadership felt they were losing face in the world’s eyes, Beijing became more and more nervous. The monks, the very same people who were supposed to have been ‘liberated’ from the clutches of the high clergy, were now revolting against the ‘motherland’. Beijing reasoned that if the situation were allowed to drift, China could follow the Soviet Union on the way to disintegration. Something had to be done. The strong men in the Politburo, Li Peng and Qiao Shi, visited Tibet in July 1988. Soon after, it was decided to appoint the young cadre Hu Jintao as Tibet’s Party chief. It was to be the crucial turn in Hu’s career. He probably knew he had to show results in a very short time to repay the confidence placed in him by the senior leaders; he could not afford to fail. Hu took charge of the rebellious region on January 12, 1989. On January 23, Hu visited the Tashilhunpo monastery in Shigatse. He was accompanied by the Panchen Lama, the second highest ranking Tibetan Lama after the Dalai Lama. The official occasion was the consecration of a stupa containing the mortal remains of one of the previous Panchen Lamas. To everyone’s surprise, during the function, the Panchen Lama denounced the Communist Party’s role in Tibet. He said, “Although there had been developments in Tibet since its liberation, this development had cost more dearly than its achievements. This mistake must never be repeated.” Four days later, he passed away in mysterious circumstances. Though it has never been proven, many Tibetans believed that he was murdered. When a demonstration erupted on March 5, the People’s Armed Police quickly took control of the situation; it was there that the future President of China showed his skills. Some information which filtered out of Tibet affirmed that on March 6 alone, 387 Tibetans were massacred around the Central Cathedral in Lhasa. In Beijing’s eyes, Hu saved Chin, which could have plunged into the ‘chaos’ so feared by the Chinese emperors. Had Tibet been lost, no doubt other provinces such as Xinjiang and Inner Mongolia would have followed in quick succession. Today at least 10 members of the 25-member Politburo are, or have been, connected with Tibet, in one way or another. Just to give a few examples. President Xi Jinping is connected through his father Xi Zhongxun who was one of the senior officials ‘in charge’ of the Tibetan affairs the 1950s and later the 1980s. One of the two lady-members, Liu Yandong has been associated with the United Front Work Department which looks after Tibet; she headed the organisation between 2002 and 2007. Yu Zhengsheng, number 4 in the hierarchy, will soon be nominated Chairman of Central Working Coordination Small Group on Tibet, overlooking the restive region’s affairs. 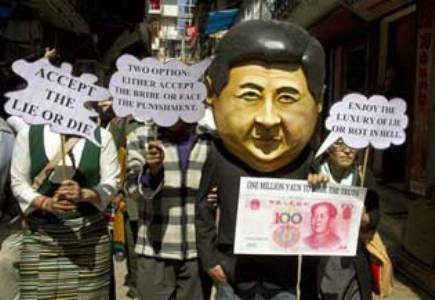 The ‘good luck’ of high Chinese officials is not that providential for the Tibetans. Most of these leaders took a harsh stance while posted on the ‘roof of the world’. NOTE— Claude Arpi is a India based French author and Tibet expert. He often writes feature stories for the Indian media.